Everyone is on a journey. We’re each headed somewhere, even if the destination is sometimes unclear. 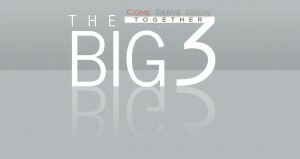 Come Together … participate in the weekend service on Sundays at 10:30am. Our worship service is a great time to re-focus our attention back onto Jesus with Christ-centered music and solid Bible teaching. Serve Together … join a ministry team where you can use your skills and passions to serve God and others. We encourage you to try different teams until you find one where you really click. We can also recommend other local organizations where you can volunteer in our community. Grow Together … connect with others in one of our groups or classes. These groups offer Biblical instruction for living out God’s plan for life…together. By intentionally plugging into these three areas, we know you will find yourself growing in your journey with Jesus and achieving the satisfaction that your time on earth is being well-spent for Him.